Auction Closed. Sold via Buy Now $800. Next Auction Monday, Nov 20. Mountain Top Inn in Chittenden is a stunning, uniquely Vermont resort. Most artists I know have a strong independent streak. I for one like to blaze my own trail. But that doesn’t mean I don’t appreciate a good suggestion. As you might imagine, I receive many painting suggestions. Every once in awhile, one gets done. Please Note: Unless a “Buy Now” occurs, this auction is scheduled to run two weeks until Monday, Nov 27. I’ll be hunkered in the studio painting several Private Commissions due for Christmas. You captured this Inn so beautifully! I looked up this Inn. I very much want to visit. Have never made it to Chittenden since we live up north but you sure do make it look like a place we should visit! 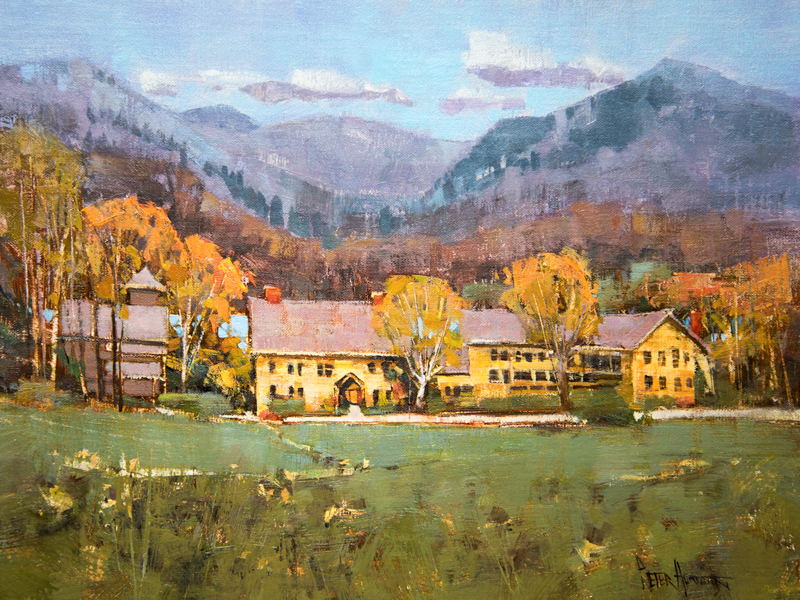 The warm colors of fall trees and the Inn itself glow beautifully against the greens and blues of field and mountain. Also, artistic emphasis (exaggeration) of the rugged rise and fall of the surrounding countryside evokes a sense of awesome wonder, conveying so much more than the reference photo. An amazing history as well in the mountains north and east of the inn where a settlement existed on the “Green Road” in the 1800’s. You can still see the cellar holes.